We find carbon in four main places, the ocean, the soil, the atmosphere and in vegetation. The carbon problem is simple really, we have extracted it from the earth in various forms and vented it into the sky. Since the start of the industrial revolution, we have increased CO2 in the atmosphere by 140%. So, now we have to stop emitting it, or put it back were it came from, or both. The EcoWatch website suggests eight ways to achieve sequestration. If we maxed these solutions all out we would achieve a reduction of 89 gigatonnes of CO2 per year. According to these figures humans cause about 40 gigatonnes of CO2 anually, so we would be well on the way to mitigating some of the impacts of climate change. In New Zealand there is a lot of angst about when the nation brings farmers into the Emissions Trading Scheme. In 2016 emissions from agriculture were 39.8% of total emissions, second only to energy at 49.2%. But according to the Drawdown Project, the food sector has potential to achieve 31% of its Drawdown target by 2050. There are a number of strategies, including silvopasture, using biochar, regenerative agriculture practices and managed grazing. The soil holds more carbon than the atmosphere and has potential to absorb a lot more. Unfortunately, too many farmers are using practices that deplete the soil even more. In the Ministry for the Environment’s publication Our Land 2018, our topsoil continues to wash into the see in alarming volumes and soil structure is degrading. Forty-four percent of the sites tested were below the target range for the macroporosity soil indicator (indicating soil compaction). Soil compaction makes the soil less productive, and can reduce soil biodiversity and restrict plant growth. As it impedes drainage, it can also result in increased greenhouse gas emissions from urine on soils, and an increased amount of phosphorus and eroded soil reaching waterways (page 72). But pasture can sequester as much carbon as forests! This New York Times feature explores the issue in depth. Fortunately there are farmers in Northland who are using regenerative agriculture practices to grow topsoil and sequester carbon. 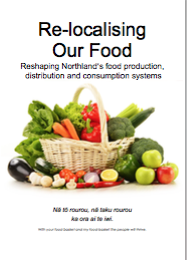 All over Taitokerau there are farmers striving to work with nature to be sustainable. Our challenge is to learn from one another and master the practices that will make farming economically viable and part of the climate change solution.